Every year since 1998 a velvety green Border Patrol Santa Claus, with a Customs and Border Protection insignia in the middle of his floppy, winter hat, shows up near Sonoita, Arizona to donate gifts and prepare meals for children in need. The Border Patrol Santa also gives these kids Photo: CBPrides in a horse-drawn carriage. 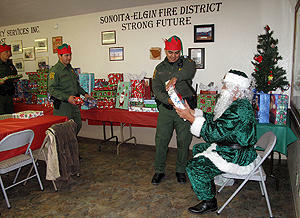 These appearances in Sonoita are not the only appearances the Border Patrol Santa has had. In December 1993, the Border Patrol Santa came down from the sky across the street from where the El Paso-based group the Border Rights Coalition (BRC) was holding a press conference to criticize the recently-implemented Border Patrol strategy Operation Blockade (later renamed Operation Hold-the-Line). As Timothy Dunn documents in the book Blockading the Border and Human Rights: the El Paso Operation That Remade Immigration Enforcement, instead of coming down with reindeer and a sled, this Santa Claus came in a noisy helicopter, stunning the small, gathered audience at the BRC press conference, and then getting the majority of the local media thunder. Over the years Border Patrol public relations efforts like "Operation Santa Claus," have gone a long way to promote strategies like El Paso's Operation Blockade of amassing forces and technology to police the U.S.-Mexico boundary. Comedians Cheech and Chong, however, contest the notion that Santa Claus was ever a Border Patrol agent (see video below). He was, they say, in fact detained at the U.S.-Mexico border and since then, due to the cross-border nature of his work, been subject to the regime of identification. Santa's reindeer, Cheech and Chong allege, have also been shot at.